Welcome! You have probably come to this website because you are facing a challenge in your country related to human resources for health (HRH). 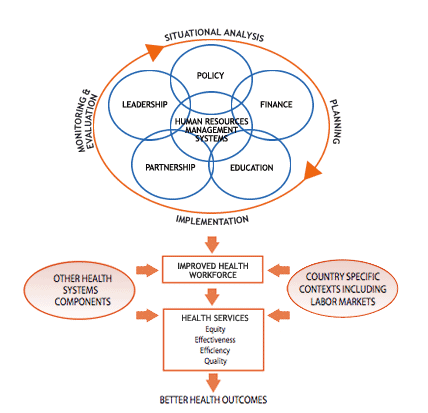 The HRH Action Framework presented here is designed to assist governments and health managers to develop and implement strategies to achieve an effective and sustainable health workforce. By using a comprehensive approach, the Framework will help you address staff shortages, uneven distribution of staff, gaps in skills and competencies, low retention and poor motivation, among other challenges. The HRH Action Framework diagram (at left) includes six clickable Action Fields (HR Management Systems, Leadership, Partnership, Finance, Education and Policy) and four clickable Phases (Situational Analysis, Planning, Implementation and Monitoring & Evaluation). To ensure a comprehensive approach to an HRH challenge, you will eventually need to address all Action Fields and Phases of the Action Cycle. However, the Framework is constructed so that, based on your particular areas of interest, you can select any Action Field or Phase and drill down to access relevant tools and guidelines, indicators and resources. You can also learn more about indicators to measure the Improved Health Workforce Outcomes resulting from the implementation. While the HRH Action Framework is applicable in all countries, the way you use it will be influenced by the elements specific to your country context (for example, the economy, the political situation), including the labor market (the capacity of the health workforce in general, international labor influences). The outcomes of applying the Framework will also be influenced by the strength of other components in your health system (for example, the availability of drugs and equipment, the level of technology available, the number and condition of health facilities). Before proceeding to the Framework diagram, review the Critical Success Factors that will help you make this systematic and comprehensive approach work well. In addition, it is essential to establish an HRH leadership team in order to undertake the kind of coordinated effort needed to address HRH issues. This should be a multi-stakeholder team that includes the major health service employers, relevant government departments, regulators, training institutions and employee representatives. See the Leadership Action Field of the Framework for assistance in establishing this team and providing leadership to achieve an effective and sustainable workforce. Now go to the Framework diagram and choose where you want to start working. The Framework will guide you through the Action Fields and phases of the Action Cycle. The HRH Action Framework website has been developed as an initiative of the Global Health Workforce Alliance (GHWA) and represents a collaborative effort between the U.S. Agency for International Development (USAID) and the World Health Organization (WHO). CapacityPlus is the website administrator. The HRH Action Framework does not represent an official view of the World Health Organization. Similarly, the information provided on this website is not official U.S. Government information and does not represent the views or positions of USAID or the U.S. Government.